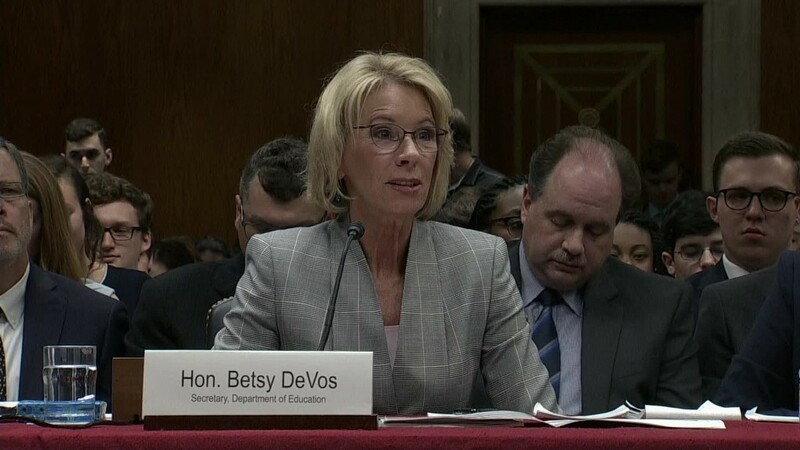 Democratic attorneys general from 18 states and Washington D.C. sued Education Secretary Betsy DeVos on Thursday after she delayed an Obama-era rule meant to protect student borrowers. The Borrower Defense to Repayment rule was created in 2016 and was set to take effect on July 1. But DeVos announced in June that she would delay its implementation. Instead, she directed her department to create committees to review and improve the rules. The rule would have clarified the federal loan forgiveness process for students who were defrauded or misled by their colleges. While students in this situation could previously apply for forgiveness, the rule would have created several protections. First, it created standards for students going through the process. And it set up a fast-track application for students who were enrolled in a college when it shut down, or were involved in instances of widespread fraud. The rule also banned schools from requiring students to sign mandatory arbitration agreements that waived their rights to go to court. DeVos's move to delay Borrower Defense "is a betrayal of her office's responsibility and a violation of federal law," said Massachusetts Attorney General Maura Healey, the lead plaintiff in the lawsuit. She accused DeVos of "sid[ing] with for-profit school executives against students and families drowning in unaffordable student loans." She said the Borrower Defense regulations "suffer from substantive and procedural flaws," citing a separate lawsuit brought against the department in May by a group representing for-profit colleges in California. That group is seeking to block the rule from going into effect, complaining it "threatens the existence" of many of its member institutions. DeVos decided it was time to "hit pause on these regulations until this case has been decided in court and to make sure these rules achieve their purpose: helping harmed students," Hill said. The Borrower Defense rule was created in part to address the unprecedented number of students applying for loan forgiveness following the collapse of the for-profit Corinthian Colleges, which had misled prospective students with inflated job placement numbers. The part of the rule that fast-tracked students who attended closed schools was implemented early to help Corinthian students, specifically. Thousands of former students from Corinthian Colleges, the American Career Institute and ITT Tech have been approved for loan discharges under the rule. As of January, 28,000 former Corinthian students alone had been approved for debt relief totaling $558 million. The lawsuit filed in federal district court in D.C. Thursday asks the court to declare the delay unlawful and order the implementation of the Borrower Defense rule. Attorneys general in California, Connecticut, Delaware, Hawaii, Iowa, Illinois, Maryland, Minnesota, New Mexico, New York, North Carolina, Oregon, Pennsylvania, Rhode Island, Vermont, Virginia, Washington and the District of Columbia joined Massachusetts' Healey in filing the complaint Thursday. CNN's Greg Wallace contributed reporting for this story.